A man protests during a rally against the Confederate flag Saturday in Columbia, South Carolina. How many politicians does it take to bring down a flag? Because there’s an increasingly long line of them outside the South Carolina Statehouse. On Monday afternoon, South Carolina Gov. Nikki Haley called for the state Legislature to remove the Confederate flag flying over the grounds of the Statehouse. She was flanked by a large delegation of South Carolina’s federal and local officials, including South Carolina’s two Republican senators, Tim Scott and Lindsey Graham. Jeb Bush and Mitt Romney have both tweeted that they recommend removing the flag. By design, the flag is protected from political pressure. The South Carolina Heritage Act of 2000 requires a two-thirds majority vote in the Legislature to remove the flag (though some Democrats are now claiming that the original law unconstitutionally ties the hands of the Legislature). The supermajority is a serious barrier; in South Carolina and nationwide, the Confederate flag has not been opposed by even a simple majority (though that could change after Charleston). In polls conducted in recent years, Americans have mixed feelings about what the flag symbolizes and tend to feel personally indifferent about whether it appears in public at all. I looked at several polls that measured sentiment about the flag, all of which came out before the killing of nine black people last week at a church in Charleston; the white suspect has ties to white supremacist groups. But until new polling data exists, the pre-shooting polls offer a baseline measure of support for the display of the flag. Let’s start just with South Carolinians. A November 2014 Winthrop poll of adults in South Carolina found that only 33 percent of residents wanted the flag to come down, while 61 percent thought it should keep flying. The responses were very different for black South Carolinians, a majority of whom opposed it (61 percent), while 27 percent believed it should be left in place. The support for the flag is far smaller nationally, but still there isn’t a majority opposed to the flag. An October 2013 poll by YouGov found that a plurality (38 percent) of Americans opposed flying it in any public place. Nearly as many respondents (34 percent) said they neither approved nor disapproved, and an additional 8 percent simply said that they were unsure. That poll showed something else: that Americans are ambivalent about what the flag means. When asked if they view the flag as a symbol of racism or a symbol of Southern pride, 20 percent said neither or that they weren’t sure. In the 2013 YouGov survey, 20 percent of Americans said they saw the Confederate flag equally as a symbol of racism and Southern pride. A plurality of Americans (35 percent) saw the flag as primarily about Southern pride, and 24 percent saw it as linked primarily to racism. 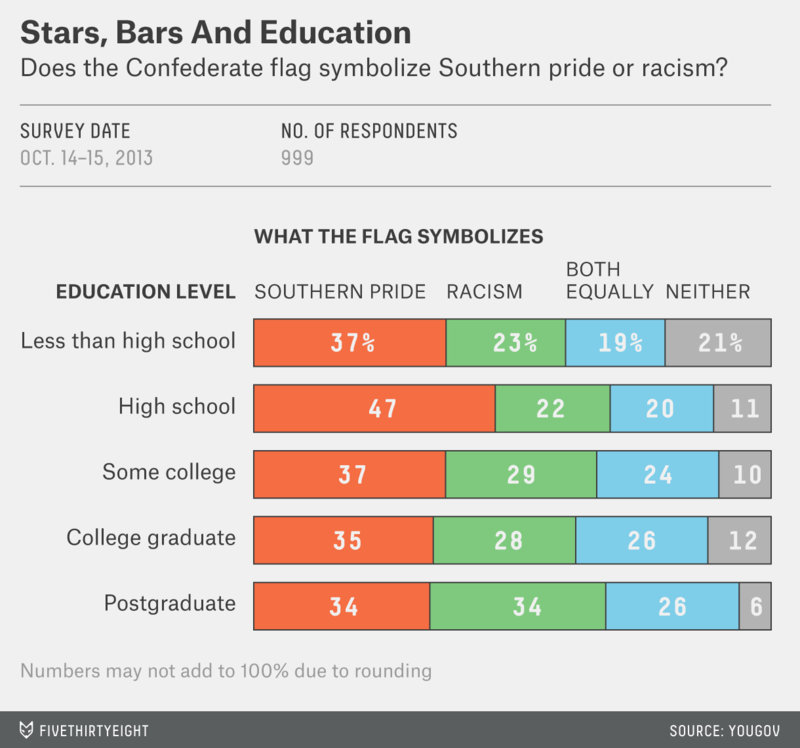 The more highly educated respondents were, the more likely they were to see the flag as a symbol of racism.1 However, the difference is modest and doesn’t come with a corresponding drop in the proportion of people identifying the flag as primarily a symbol of Southern pride. A 2011 poll by the Pew Research Center also found that a significant share of Americans felt indifferent about the Confederate flag. The majority of respondents (58 percent) said they had neither a positive nor a negative feeling when they saw the Confederate flag displayed. Very few (9 percent) stated that they had a positive feeling upon seeing the flag, and 30 percent said they had a negative reaction. Even among white respondents who identified themselves as Southerners, the majority (64 percent) had neither a positive nor a negative reaction to the flag. Twenty-two percent felt positively about seeing the flag, and 13 percent felt negatively. Given the baseline indifference that many Americans feel, South Carolina is likely to change its policy only in the wake of tragedy. In ordinary circumstances, many Americans do not feel strongly enough about the significance of the flag to demand that it be lowered. UPDATE (June 22, 5:03 p.m.): Monday afternoon, Public Policy Polling released a survey of registered voters conducted June 19-20, after the Charleston shooting. Sixty-four percent of registered voters opposed government buildings flying the Confederate flag, while 21 percent supported these displays. Fifteen percent were unsure. My analysis is restricted to those respondents who had an opinion. Respondents who had less than a high school education were most likely to say that they weren’t sure what the flag symbolized (22 percent), and those who had graduated from high school or attended some college were both much more likely to say they weren’t sure (both 10 percent) than those who graduated from college or pursued post-graduate study (both 2 percent).